What could be more befitting for an Indian Prime Minister who is proud of the rich spiritual and cultural heritage of his country than to be received in a country in the Western hemisphere to the chant of Vedic hymns by children of that country? The warm reception accorded to Narendra Modi at Dublin on September 23 with the graceful Vedic recitation by Irish children marked an indelible moment in the bilateral relations between India and Ireland. This in turn made the hearts of the 26,000 strong Indian community in Ireland and that of every patriotic Indian at home, swell with pride at the recognition accorded to the undisputed leader of the modern Indian nation as the proud inheritor of a glorious past of Vedic civilization. This thoughtful gesture of his Irish hosts was accepted with his customary élan by the Indian leader with a quip about the champions of pseudo-secularism in India! Taking a dig at the so-called secularists back home, Narendra Modi said if anyone had welcomed him in India by reciting Sanskrit slokas as was done in Ireland, then pseudo-secularists would have created a hue and cry by raising questions concerning the country’s secularism. When Prime Minister Modi met his Irish counterpart Enda Kenny in Dublin, the two leaders reviewed the bilateral relations between their countries and exchanged views on regional and global issues of common interest. The visit was expected to provide an excellent opportunity to bolster the economic ties between the two nations as there are clear complementarities between their flagship programs, in particular, Skill India and Digital India, and Ireland’s proven educational institutions. Other areas that have scope for closer cooperation for mutual advantage are information technology (IT), smart agriculture and food processing industry. On the successful conclusion of his one-day Irish visit, Narendra Modi proceeded to the USA, primarily for addressing the UN General Assembly session at New York, a traditional annual exercise. He combined this with a visit to the Silicon Valley that he took by storm. He summed up the effect of his US visit as one that demonstrated “extraordinary depth and diversity” of India-US relationship and also said that a lot of ground had been covered during the visit. Earlier, at the ‘India-US Startup Konnect 2015’ program and later at the ‘Digital India’ dinner at San Jose on September 27, he spoke of how a nation of 800 million youth below the age of 35 years was eager for change; had the energy and drive to pursue it; and, the confidence to achieve it. He also spoke of how when each of the 500 odd towns of India created ten startups and each of its 600,000 villages produced six small businesses, on a regular basis, the country would create an enormous economic momentum and generate a vast number of jobs. He also described the vision and the spirit behind the Digital India Program thus: to use technology to transform governance, eliminate barriers to opportunities, empower our citizens, deepen social change, impart scale and speed to development, improve delivery of services, customize services for specific groups, design affordable products for the poor and build a more sustainable future for our planet. Above all, he said he saw technology as a means to empower the people and as a tool that bridged the distance between hope and opportunity; and that social media connected people on the strength of human values and not identities. Referring to the India-US partnership as the defining partnership of the century, he pointed out how it could advance and further prosper in the two countries – from creating infrastructure to services; from manufacture of products to human resource development as well as from supporting governments to enabling citizens and promoting digital literacy. Digital India is a vast cyber world of opportunities open to a joint partnership. Welcoming the launch of the India-US partnership schemes that would support India’s mission, he assured the assembled technology entrepreneurs that the schemes would not trap their creativity in long government procedures. He assured them that the Indian Government was already into reforming its regulations and processes with the aim of making it easier to start and do business in India. Prominent leaders of industry who called on the Prime Minister included Satya Nadella, CEO of Microsoft; Sundar Pichai, CEO of Google; John Chambers, Executive Chairman of Cisco; Tim Cook, CEO of Apple; and Paul Jacobs of Qualcomm. In the meetings with the leaders of industry, there was a clear discussion on how these iconic companies could contribute to the Prime Minister’s flagship program, Digital India and Skill India. Tim Cook of Apple expressed great desire to be a partner in the Digital India initiative, which he thought was a transformation initiative and a game changer for India. PM Modi’s program included his participation in the G4 Summit in which he mentioned that the reform of the Security Council within a fixed time frame had become an urgent and important task. He pointed out that the Security Council should include the largest democracies of the world, major locomotives of the global economy as well as voices from all the major continents. This particular measure will carry greater credibility and legitimacy and be more representative and successful in addressing the challenges of the 21st century, he added. Addressing the UN Sustainable Development Summit, Modi outlined the poverty eradication schemes of his government and stated that India was fulfilling its responsibilities as a development partner in Asia and Africa and also with small island states from the Pacific to the Atlantic. He dwelled on the subject of climate change and stated that when nations spoke only of climate change, there was a perception of their desire to merely secure the comforts of their lifestyle. It was while speaking of climate justice that nations demonstrated their sensitivity and determination with regard to securing the future of the poor from the hazards of natural disasters. It was important, he said, to focus on solutions that could help nations reach their goals. Nations should forge a global public partnership to harness technology, innovations and finance in a bid to put affordable, clean and renewable energy within the reach of all. Equally important for nations to do was to look for changes in the lifestyles of their people that would make the world less dependent on energy and more sustainable in its consumption. It was quite important to launch a global education program that would prepare the next generation to protect and conserve Nature. He expressed the hope that developed nations would fulfill their financing commitments for development and climate change, without placing both of them under the same head! The Prime Minister attended the UN Summit on Peace Keeping in New York where he reiterated India’s commitment to the ongoing and future peacekeeping operations. Earlier in a meeting with UN Secretary-General Ban Ki-moon, he called for a change in the manner in which decisions are being taken concerning peacekeeping operations where large troop-contributing nations like India were not consulted adequately enough before peacekeeping missions were authorized. This was despite the fact that cumulatively India has been the largest contributor to international peacekeeping operations. At San Jose, Narendra Modi had three back-to-back meetings with British Prime Minister David Cameron, French President Francois Hollande (Bill Gates was a surprise visitor at the meeting with his inputs on climate change), and US President Barak Obama. He discussed with them issues like climate change, terrorism in general and the Comprehensive Convention on International Terrorism in particular, UN Security Council reform and India’s desire to become a member of the four export control regimes, starting with the Nuclear Suppliers Group (NSG) and Missile Technology Control Regime (MTCR). On UN Security Council reform, President Obama reiterated the support that he had publicly articulated in favour of admitting India as a permanent member of the Security Council. 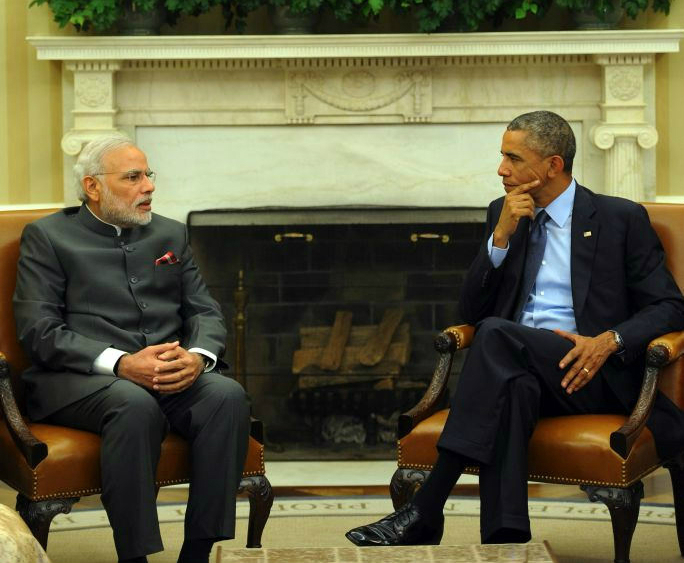 Now that the inter-governmental negotiation process was going to start, how India and the US could collaborate on that front was also discussed by the two leaders. On the issue of climate change, Modi reiterated that India’s commitment to environmental conservation was second to none. India was prepared to play a leadership role on this subject. Modi said that India had sought permission to declare its intended nationally determined contributions (INDCs) on October 2. The deadline was October 1, but October 2 being the birth anniversary of Mahatma Gandhi, who was passionately committed to the cause of environment, and was also a champion of sustainable development, India’s declaring its INDCs on October 2, would add a very significant moral dimension as well to its commitment. There was a broad appreciation for this point of view, with all the three Western leaders appreciating India for declaring its INDCs and combining it with the observance of Mahatma Gandhi’s birth anniversary. India has since fulfilled its commitment on October 2 and vindicated its principled stand in the matter. On the substantive issue of climate change, Modi made it very clear that the prevailing mood of negativism cannot be a useful factor as the world prepares for the crucial negotiations of COP 21 to be held in Paris this December. He said rather than just putting pressure over caps on emission targets, it would be far better if there is an active agenda that enables countries to opt for more sustainable development paths by providing them with finance and with the requisite technology. That was the path India had been advocating. He also outlined his own ambitious agenda for 175 gigawatts of renewable energy and the steps that he had initiated to reach that goal. There was also a discussion on some of the very innovative ideas that India had taken in this field. There was further discussion on how more such innovative ideas could be found so that the whole debate on climate change went along the path of a positive agenda rather than a negative one. President Obama was very forthcoming in the matter and said that he totally accepted the point that developing countries needed to be provided with the right technologies. In this context, he referred to the solar panels and said their prices had gone down in the US because of which they became more easily affordable for developing countries. He said this became possible because of a conscious decision on the part of the US government to make these technologies inexpensive. Modi called terrorism a global phenomenon that had an impact on each and every country without exception; no country was immune from its threat, which India had been battling for four decades. He said the time had come for the international community to speak with one voice on this issue and resolve the long pending finalization of the Comprehensive Convention on International Terrorism, which had been held up because of the disagreement on the definition of terrorism. Modi also spoke of India’s aspiration for membership to the four export control regimes. There was broad support from all the three interlocutors who stated that they wanted to see India as part of these non-proliferation regimes in view of its impeccable track record in this particular area. Apart from discussing issues of concern common to the three interlocutors, Modi separately discussed with them matters of bilateral interest concerning their respective countries. 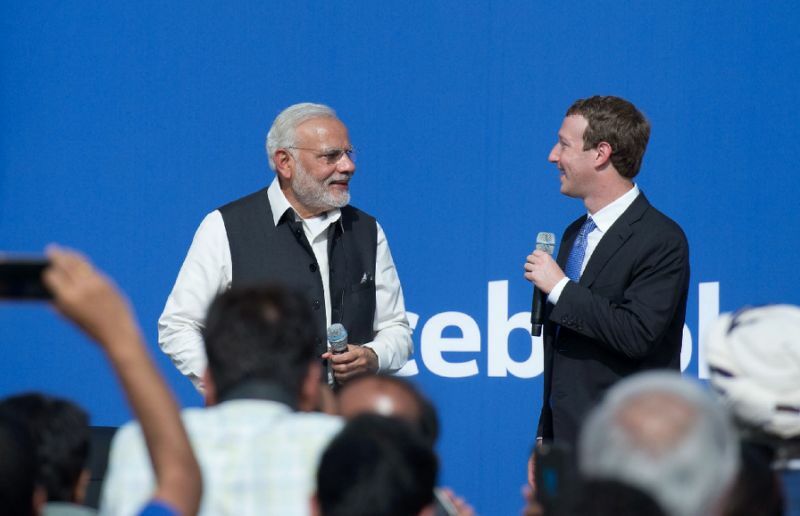 Narendra Modi visited the Facebook headquarters on September 29 where he was received by Mark Zuckerberg and Sheryl Sandberg. Modi wanted to know how social media could be used for giving greater coverage to the Indian government’s social program such as Swachh Bharat, etc. Later, at an event at the Town Hall, Modi answered various questions on the role of social media and some personal questions pertaining to his early life, the role of his mother in his life, etc. The Q&A session was fraught with poignancy and nostalgia on the part of the Prime Minister, which gave the audience rare insights into the leader’s personality, making the occasion quite momentous and unique. Modi visited the Google headquarters where he was received by Eric Schmidt and Sundar Pichai. Larry Page, co-founder of Google, was present too. They showed the Prime Minister three or four of their top technologies like Google Earth, the Iris project, Knowledge Panels, Project Loon, etc. Eric Schmidt said he was very excited about the Prime Minister’s initiative to bring Digital India to every corner of the country. Modi evinced keen interest in Google’s flagship project, Project Loon, which is aimed at bringing internet access to hitherto unserviced areas that have no internet signal at all. Google is doing a pilot project in Andhra Pradesh, the idea being to target rural areas that still do not have internet penetration. Modi felt this could be a very, very significant innovation to help with rural connectivity. The Google top brass said if internet access is expanded, then 160 million people could be lifted out of poverty. So, the Prime Minister immediately felt the usefulness of the application of Project Loon for areas such as long distance education, rural schools, telemedicine, etc. There was a discussion on the project that Google was now doing in partnership with the RailTel to offer Wi-Fi connectivity at 500 railway stations in India. Starting with Mumbai Central, the project, the biggest in the world, would roll out to 100 railway stations. There was also a discussion on the possibilities of Google technologies for the agricultural sector in terms of developing an algorithm, etc. 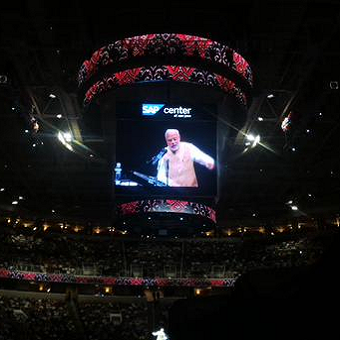 After visiting Facebook and Google Inc headquarters on Day 2, Narendra Modi was accorded a grand reception at SAP Center, San Jose and he addressed a mega event at the San Jose Convention Center that was attended by 18,000 people. In a way, this was the West Coast trying to outdo the East Coast, which had a similar privilege last year. If the rockstar reception of 2014 at Madison Square Gardens, New York had been in anticipation of the tasks that Modi had set out to accomplish as the newly-elected Prime Minister, the latest one at San Jose was in clear recognition of his wowing the world in his inimitable style with his ambitious schemes and ingenious programs for good governance during the past sixteen months. Suffice it to say that the Prime Minister’s candid question at the event as to what the audience thought of his performance and acquittal of a blemishless and corruption-free personal conduct, was more than amply answered by the deafening chanting of his name by the 18,000-strong exultant audience. Narendra Modi started off his address by paying tribute to Shahid Bhagat Singh on the latter’s birth anniversary and finished his speech by announcing a good news – that Air India would be commencing a non-stop flight from Delhi to San Francisco in December. He also said that the mission of his government was JAM – ‘Jan Dhan’ bank accounts for all, Aadhaar unique identity card and Mobile Governance. The rest of his speech was devoted to the accomplishments and achievements of his government, besides being interspersed with patriotic fervour. He also paid heartfelt tribute to members of the Sikh community who had migrated to the West Coast in the 1940s to work as farm labourers and founded the Gadar Party that campaigned for India’s Independence from colonial rule. Praising the role of the Indian diaspora on the West Coast in making a mark not only for themselves but also for India with their technical expertise and professional prowess, he spoke of how the rest of the world was looking upto India as the most outstanding performer among the BRICS group of nations. He reassured his captive audience that the 21st century was going to be universally acclaimed as the century of India. He disowned all credit for the transformation of India’s fortunes and recognition at international fora like the World Bank, IMF and rating agencies like Moody’s and attributed it to the 125 crore people of India. Rubbishing all talks of “good terrorism” and “bad terrorism” (by Pakistan which he did not name), he seized the occasion to reiterate India’s stance on terrorism and urged the UN not to lose any more time in coming down heavily on what has now become a global phenomenon. Meanwhile, he struck a positive note and emotional chord in the audience by stating that he viewed the exemplary collection of so many illustrious Indian nationals on the West Coast not as Brain Drain but as Deposit of Brain which could turn as Brain Gain for their motherland’s economic transformation at the appropriate moment. The crowd rose as one man to express in unison its solidarity with PM Modi. Prime Minister Modi attended a roundtable conference on renewable energy, which saw the participation of international experts and authorities on the subject as well as Nobel Laureates and academics. The participants felt India had the potential to emerge as the clean energy capital of the world. And with electricity storage becoming inexpensive, clean and renewable energy will soon become a viable and affordable energy option. On his part, Modi emphasized India’s commitment to realizing the vision for 175 gigawatts of clean energy. He said there was massive scope for investment in the sector, for example through the railways, where 100% FDI had been made admissible. He also gave an overview of initiatives already undertaken by his government in the area of renewable energy. The Indian Prime Minister had separate bilateral meetings with his counterparts from Bhutan, Nepal, Sri Lanka, Sweden, Cyprus, Egypt, Palestine and Mexico and a brief meeting with Prime Minister Kenny Anthony of St Lucia. The personal involvement, understanding and tireless interest displayed by Prime Minister Modi in the schemes and projects for eradication of poverty and digitalization of India, were a tremendous source of inspiration for the American corporate honchos and technology entrepreneurs who are vying for a piece of the great Indian business pie. This US visit of Narendra Modi, second as Prime Minister, turned out to be a resounding success just as his first one of last year. It made everyone wonder yet again as to what made Modi stand out as the most popular and successful Prime Minister of India. It was undoubtedly his ability to combine the down-to-earth qualities of modesty about his past, which was evident in his interactions with global leaders and corporate honchos, pride in the spiritual and cultural ethos of India and political pragmatism vis-a-vis the Hindutva ideology of his party. All these allowed him to have no constraints about doing business with capitalist and theocratic nations. This in turn, seems to have made his interlocutors at the international fora more receptive to his ideas and initiatives in comparison to his predecessors. For instance, Jim Yong Kim, President of World Bank said that Prime Minister Modi’s reforms have had an enormous impact on the way the world looks at India. This was no mean compliment by any standard, not even by the standards of the Congress Party, which had lashed out in animosity by denigrating the Prime Minister’s visit as a mere fashion show! This entry was posted in blog on October 9, 2015 by admin. No matter what US and France say and do, they will not allow India to become part of UN Security Council. China will not let this happen but there is Russia who can help out India in this. When PM Modi had not visited Ireland we rarely knew that more than 25 thousand Indians live in that country. I can bet that money sent back home by Indians abroad will increase multi-fold in upcoming days, all thanks to Narendra Modi. 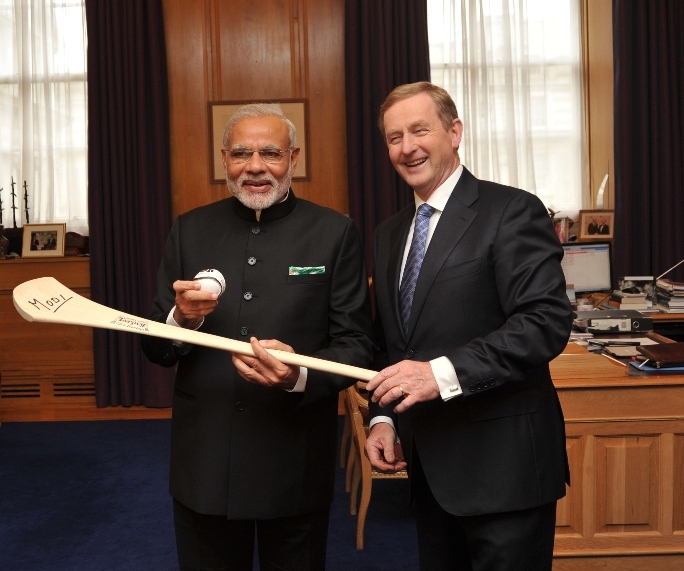 It was good to see Ireland PM and Indian PM giving gifts to one another. Personal relations, like UK has with US and European countries have among themselves, will make India grow in the eyes of outside world. I am sorry but he may go to any country in the world for branding of Make in India, but unless Indian laws and regulations and Indian offcials are made receptive, there will be no improvement in India’s image for investors. Why all are just talking about Digital India? Will a farmer benefit from this? Will army people benefit? Only middle class and business men will thrive in NDA rule and poor will still remain poor. Congress had so many years to take India at par with other countries. Now when BJP government is doing this then they have issues with PM’s suit. This article should be sent to Congress headquarter in New Delhi. Famous quote “Modi’s hug isn’t for everyone’. This tells that we have the most talented prime minister in the world. Zuckerberg must not breach net neutrality by bringing internet.org. Rest your analysis is very right. RSS is not happy with the way BJP is performing. They have turned blind eye to farmers and poor. Also, BJP leaders should mind their words while they talk about opposition. Learn some ettiquetes from Vajpayee Ji and Advani Ji. In Ireland Sanskrit was used as honour for Indian premier. In India people talk about manipuri, odia and urdu and do not allow Hindi to become national language. We all need great support for Hindi and Sanskrit. Many controversies arose spending crores of money visiting countries ? Digital India program without solving net neutrality ? And why hasn’t any China Trip successful ? On one hand our prime minister is talking about peace and harmony missions in United Nations and on the other Azam Khan has written letter to UN Secretary. What a tragic situation for India. That is why we need only BJP in entire nation.